My daughter loves playing kitchen, having tea parties and doing all sorts of art projects. I think every kid needs to have their own table that's just their size. I wanted something that would be cute, stylish, durable and not just a folding table. Cute children's tables can be pretty pricey and you know that's not my style. I found this one at Ikea for $20 and put my own spin on it. Enjoy! Also please click to follow me and leave a comment so I know you were here! I really appreciate all the support! Measure each place you want to cover with paper. I used coordinating paper, but used a different piece on every section. I covered all sides of the chairs including the seat. For the table I used the stickers to cover all sides. Apply modge podge one section at a time and adhere paper. I also put a layer of modge podge over the paper and stickers to give it extra protection and to make it easy to wipe off. I love what you created with this table! I have a project in mind and dint know where to start...maybe you could come over and give me some ideas?! I'm dropping by from Creations by Kara. Love your table and chairs. I just posted pictures of a chair redo that I did using napkins for the design. I'll have to try your way too! Cute! Love the fun, bright colors! Awesome job! I LOVE mod podge!! I'd love to invite you to share your projects at my weekly linky party….that I host every Friday. I think my viewers will LOVE your projects too. Thanks for the consideration. This is great! I have two of these tables in my classroom. I think they need a new look before school starts! Thanks for linking to Home and Family Friday! Stopping by from MMS furniture feature friday. So adorable!! We have the same table set and I was just thinking of painting it, but this is EVEN better!! Love it! this is so pretty! I love your blog too, I 've just found it. Lots of great posts. Wickedly cute Marie! That would look great in my Granddaughter's bedroom. Following your blog now.I would love for you to show this off at my Wickedly CraftySaturdays! What a great idea. 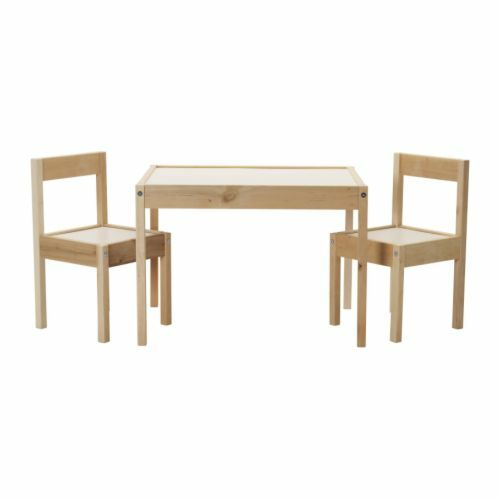 I have been looking for a cute toddler table but they are all pretty boring. It is more fun to do it yourself anyway. I would love it if you would stop by and link this post up to my crafty link party that I just started at Lines Across My Face. Absolutely darling! Your daughters must be over the moon! Dropping by from Under The Table & Dreaming. Super cute! I love making things like this! If your little one loves playing kitchen, check out our Wooden Play Kitchen spotlight this week and enter to win our Felt Food Give-Away! so creative! I love the patterns you used! This is definitely on my "to do" list!! Hiya! Found this on NJAH, and I recognized the Ikea set we also have for our toddler. I love this idea! I will use some of the scrapbook paper I already have to get started. Quick question: do you find the modge podge does a good enough job of handling a toddler's mess and damage? Thanks! FYI - just finished painting the chairs.... I have some great scrapbook paper for a more gender neutral version of your fun table and chairs (one son, and one surprise on the way!) I will send you a link to my finished project when it's all done. Paint better dry FAST, my due date is less than two weeks away!